I just got my package of two wines from Wine Insiders for signing up with a promotional membership which included a bottle of Monarch Glen 2006 Merlot and Cannery Row Cellars 2006 Chardonnay. 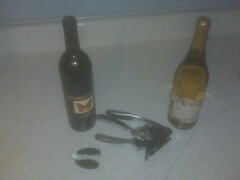 Along with these two bottles was a Rabbit Style Corkscrew Remover. For your viewing pleasure here is a video of this fancy tool that anyone who’s had a few bottles to drink could figure out. For those of you that do not know, the word uber is commonly used by geeks to describe something of the highest authority or dignity in a determined category. It is actually a german word which can be best described by its wikipedia article. If you’d like more official information, or perhaps a free sample of this uber period pad, check out the Always Infinity official website. So, for those of you that do not know I stopped my cereal diet. It wasn’t because I couldn’t have done it, it was because I went to the doctors last Monday. Come to find out cereal has a lot of salt in it (at least when you’re eating 8 servings). Now, that typically wouldn’t be a problem if my blood-pressure wasn’t 168/88 (yeah, you can say it, “damn”). They told me to cut back on my salt, so I have been. I reduced my salt intake to less than 250mg (that’s about 10% of your recommended daily value). That has been probably the hardest thing I’ve ever done. Today I went to the doctors again for my checkup after being on the medication for a week they put me on. Come to find out it isn’t working as well as they’d like (its now 148/80). So, they put me on a stronger dose with some special drug-amplifier stuff in it. Some people (Eric) were concerned about me dropping my salt intake so low. I asked my doctor if it was safe to eliminate salt completely from my diet, it is. The American Heart Association recommends somewhere between 0 and 1000mg per day. The recommended daily value on food nutrition labels goes off of a 2400mg scale, which means I’m peachy-keen. I also asked if I could drink alcohol with my pills, I can. The only problem is drinking too much/often will also cause high-blood pressure problems. He highly suggested (pretty much demanded) that I exercise. So, I may take him up on that and start doing so. I guess, if it’ll save my life, I’ll do it. Today I got my $100 cell phone rebate from Lets Talk. Along with that I got a computer magazine that I quickly disposed of. Under that magazine was a hard envelope containing my diploma. It’s a good feeling to know that I did truly graduate (and you all doubted me)! Right now I’m putting together some ideas for a couple website proposals. I’ll fill you in with more details when I get something out there.